Admittedly, this is a limited sample size, but for what it's worth here are the results from our earlier poll. 5-1 votes for sponsors spending less on activation this year (with 3 votes saying sponsors maintained current spending). Is this because sponsors are finding more sophisticated, resourceful and efficient ways to accomplish more with less, because they are cutting back on activation expenses along with rights fees in a tough environment or perhaps a combination of other reasons? 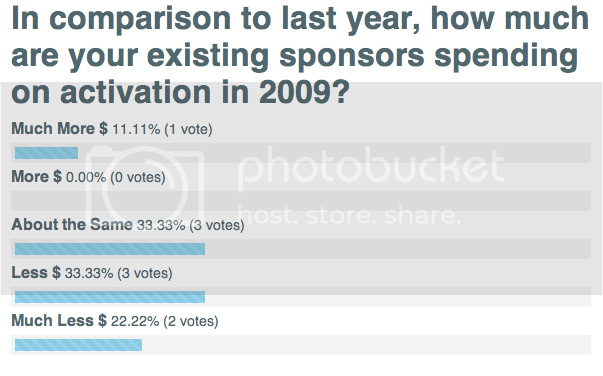 Are sponsors even spending less on activation? One could argue that sponsors who are trimming their portfolio (and rights-spend) should devote an even higher proportion of their budget to activate around and make the most of a downsized/core portfolio of properties. Again, a very small sample, but comments/opinions welcome!